Myanmar officials and media wish to simply see the Rohingyas as ‘illegal Bengali immigrants’, a credulous reading of history at best. The intentions of this inaccurate classification, however, are truly sinister for it is meant to provide a legal clearance to forcefully deport the Rohingya population. Myanmar President Then Sein had in fact made an ‘offer’ to the UN last year that he was willing to send the Rohingya people “to any other country willing to accept them.” The UN declined. Rohingya Muslims, however, are native to the state of “Rohang”, officially known as Rakhine or Arakan. If one is to seek historical accuracy, not only are the Rohingya people native to Myanmar, it was in fact Burma that occupied Rakhine in the 1700’s. Over the years, especially in the first half of the 20th century, the original inhabitants of Arakan were joined by cheap or forced labor from Bengal and India, who permanently settled there. For decades, tension brewed between Buddhists and Muslims in the region. Naturally, a majority backed by a military junta is likely to prevail over a minority without any serious regional or international backers. 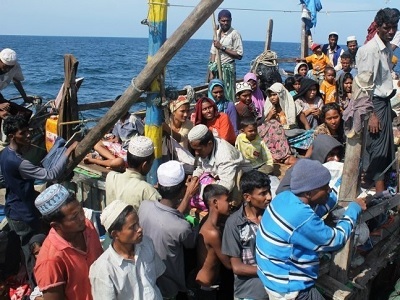 Without much balance of power to be mentioned, the Rohingya population of Arakan, estimated at nearly 800,000, subsisted between the nightmare of having no legal status (as they are still denied citizenship), little or no rights and the occasional ethnic purges carried out by their Buddhist neighbors with the support of their government, army and police. The worst of such violence in recent years took place between June and October of last year. Buddhists also paid a heavy price for the clashes, but the stateless Rohingyas, being isolated and defenseless, were the ones to carry the heaviest death toll and destruction. And just when ‘calm’ is reported – as in returning to the status quo of utter discrimination and political alienation of the Rohingyas – violence erupts once more, and every time the diameters of the conflict grow bigger. In late February, an angry Buddhist mob attacked non-Rohingya Muslim schools, shops and homes in the capital Rangoon, regional and international media reported. The cause of the violence was a rumor that the Muslim community is planning to build a mosque. What is taking place in Arakan is most dangerous, not only because of the magnitude of the atrocities and the perpetual suffering of the Rohingya people, which are often described as the world’s most persecuted people. Other layers of danger also exist that threatens to widen the parameters of the conflict throughout the Southeast Asia region, bringing instability to already unstable border areas, and, of course, as was the case recently, take the conflict from an ethnic one to a purely religious one. In a region of a unique mix of ethnicities and religions, the plight of the Rohingyas could become the trigger that would set already fractious parts of the region ablaze. Although the plight of the Rohingya people have in recent months crossed the line from the terrible, but hidden tragedy into a recurring media topic, it is still facing many hurdles that must be overcome in order for some action to be taken. While the Association of Southeast Asian Nations (ASEAN) has been making major economic leaps forward, it remains politically ineffective, with little interest in issues pertaining to human rights. Under the guise of its commitment to ‘non-interference’ and disproportionate attention to the festering territorial disputes in the South China Sea, ASEAN seems unaware that the Rohingya people even exist. Worst, ASEAN leaders were reportedly in agreement that Myanmar should chair their 2014 summit, as a reward for superficial reforms undertaken by Rangoon to ease its political isolation and open up its market beyond China and few other countries. Meanwhile, western countries, led by the United States are clamoring to divide the large Myanmar economic cake amongst themselves, and are saying next to nothing about the current human rights records of Rangoon. The minor democratic reforms in Myanmar seem, after all, a pretext to allow the country back to western arms. And the race to Rangoon has indeed begun, unhindered by the continued persecution of the Rohingya people. On February 26, Myanmar’s President Sein met in Oslo with Norway’s Prime Minister Jens Stoltenberg in a ‘landmark’ visit. They spoke economy, of course, for Myanmar has plenty to offer. And regarding the conflict in Arakan, Jens Stoltenberg unambiguously declared it to be an internal Burmese affair, reducing it to most belittling statements. In regards to ‘disagreements’ over citizenship, he said, “we have encouraged dialogue, but we will not demand that Burma’s government give citizenship to the Rohingyas.” Moreover, to reward Sein for his supposedly bold democratic reforms, Norway took the lead by waving off nearly have of its debt and other countries followed suit, including Japan which dropped $3 billion last year. While one is used to official hypocrisy, whether by ASEAN or western governments, many are still scratching their heads over the unforgivable silence of democracy advocate and Noble Peace Prize recipient Aung San Suu Kyi. Luckily, others are speaking out. Bangladesh’s Nobel laureate Muhammad Yunus, along with former Timor-Leste president Ramos-Horta had both recently spoke with decisive terms in support of the persecuted Rohingya people.